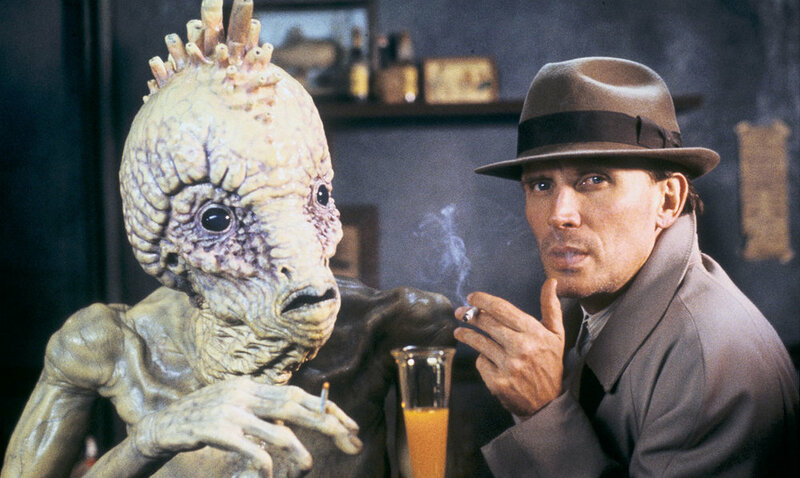 From director David Cronenberg [THE FLY (1986), A HISTORY OF VIOLENCE (2005), A DANGEROUS METHOD (2011)] comes the film adaptation of William Burroughs's modern literary masterpiece The Naked Lunch. The book was as controversial as it was ground-breaking, and was banned for many years for its sensational content. A semi-autobiographical account of Burroughs's inner journey, this surreal fantasy pulls its audience into a world of spies, witches and mutating monsters. A brilliant exploration of the power of the creative urge, the film serves as a metaphor for the struggle of the writer's mind to make sense of the modern world. Set in 1952 in New York City during a fierce winter, pest controller William Lee [played by Peter Weller of ROBOCOP (1987)] makes his daily rounds, poisoning cockroaches throughout the city's tenement buildings. But one day he discovers that his wife [Judy Davis, BARTON FINK (1991), HUSBANDS AND WIVES (1992)], has become addicted to his poison powder. Lee's grim life begins to unravel.